When you’re starting out in blogging, one of the most frustrating things is getting people to read your blog. Of course, one of the easiest ways is by guest blogging – writing on a larger more established blog an ace piece on how they can make shed loads of money by scratching your arse can lead to a huge amount of visitors. Visitors lead to cash, cash leads to women. Question is, how do you find these opportunities. Originally, with some nifty google searching or knowing your niche, then you’d struggle. First My Blog Guest came along, which is pretty good. But next along is the rather excellent looking Guestr. 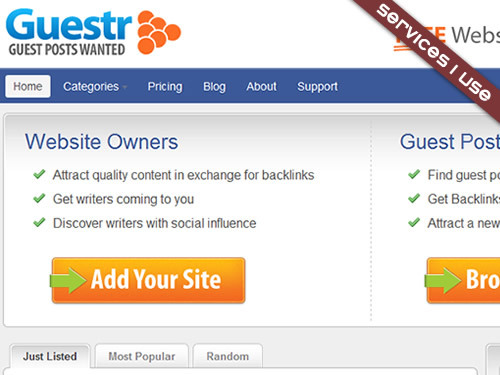 Guestr appears to be much more of a directory, rather than a community. This can have it’s faults as people won’t necessarily visit a directory (you wouldn’t willingily read a telephone book, would you? ), however it can be a good place to browse sites that you may not be aware of. Furthermore, the guys behind the site do seem to be knowing what they’re doing, with Flippa being the standout name on Luke Moulton’s resume. Guestr is currently free to register, so there’s no point in not registering. If you’re looking to guest on this blog (and – lets be brutally honest – why wouldn’t you? ), you can view my advert here.